Reserved until July 22 ? The last reservation of this item will conclude on July 22. For rentals that require shipping or a pickup at a non-headquarter location, please select a later date for your arrival. Headquarter offices are the only locations that can accept a same-day reservation, as transit time is not calculated in this date. 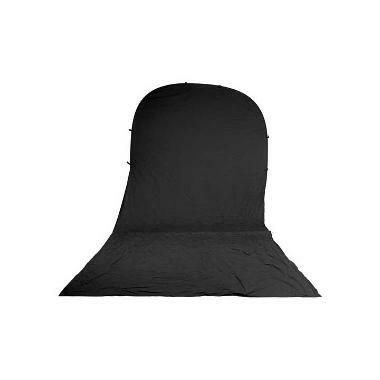 The Impact 8 x 16' Black Collapsible Background is cloth sewn taut around a wire frame with free, loose cloth at the bottom for floor draping. It does not include a stand but the rigid frame can be leaned against a wall in a pinch. It can be collapsed down into a 3' circle for easier transport. It is ideal for head shots and photo booths. • This rental is for the backdrop only and does not include a stand. • Backdrop may arrive to you wrinkled. Prepare accordingly. It can be safely steamed/ironed (just avoid ironing over the outer frame). • We do our best to keep the background clean. To help us out, if you have a spill, please spot clean as soon as you can with anything not containing a bleaching agent.